An all natural incense made with amber resin, fragrance is earthy and herbal. 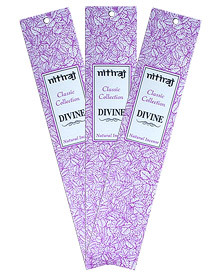 The incense is all natural and is a masala incense. A specially blended temple incense which is strong. Contains camphor, herbs, resins and spices. Each sticks burns for almost 2 hours!!! 10 grams per pack, approximately 5 sticks. The incense is all natural and is a masala incense. Masala means the incense is made in a method which uses natural wood powders, resins and oils combined together to form a dough like mixture. This mixture is then rolled on to a bamboo stick then lightly coated with additional sandalwood powder. The result is a far superior incense which burns very slowly and the after aroma can remain for days. Contains 10 grams per pack, approximately 12 sticks.